Our harbour marina has gone from a ghostly quiet, snow covered ships graveyard in March when we arrived back from Sydney with just a handful of hardy live-a-boarders to a 24-hour commercial fishing centre for the frantic months of the salmon season. It is now winding back to its peaceful village atmosphere as the last of the Seiners leave south for Seattle or are strapped in their berths for winter and the gill-netters are hauled out and wrapped up beside the now quiet canneries. 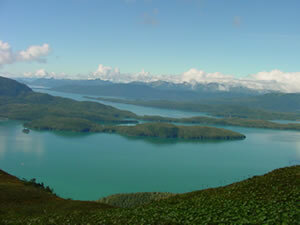 This aerial view from above Cordova gives an indication of what a remote place it is. The tiny white dot is illywhacker is making her way home for the season. We had perhaps a dozen yachts sail through Cordova this season, swelling the numbers of our Prince William Sound YC to about 20. Only 3 of these yachts were foreign sailors, hardy enough but not from Alaska and on their way to southern, warmer cruising grounds. One yacht, from Belgium, "Windekind" wed met in Japan and theyd called in to see what we were raving about. It wasnt long before Alfons and Clara were talking of wintering over too, the stunning backdrop of mountain scenery surrounding this charming village soon got to them and after a few walks and salmon fishing expeditions on the Eyak River they were as hooked as we are. 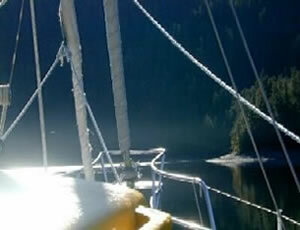 Cruising in Prince William Sound is to witness the some of the results of global warming. 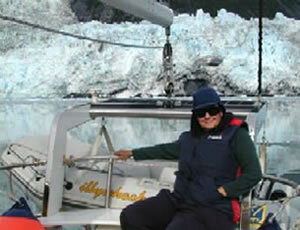 Glaciers abound and are known to be melting at a faster rate than ever before. Many are tidewater and these calve into the Sound ever more frequently as Summer progresses. There is nothing more awe-inspiring than to bring illywhacker in as close as we dare to the glacier face, turn off the engine and just float amongst the broken ice listening to the immense cracking and groaning behind. If we wait patiently we see city building size chunks break away in a cloud of spray and moments later feel the boat roll in the swell. The scale is unimaginable. Looking up behind the glacier it is as though Sydney Harbour were an ice river on a 45 deg slope from Parramatta and at the Heads a 200m sheer face plunges down to the sea where we wait and watch in the smallest of craft. The wonder is that there are so many of these in our one waterway of just over 100nm across. Mostly its just us, another yacht is a rarity although occasionally a cruise ship in ghostly relief will appear on the horizon. The anchorages are remarkable. 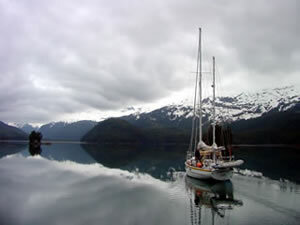 As an example, the cruising guide quotes Bettles Lagoon as: "
". The environment is pretty much unspoilt and weve had it largely to ourselves BUT were willing to share some anchorages and some photos and tales to match with our CCC friends when we arrive back in Sydney this year.